Our in-home decorating services takes the risk of decorating on your own. We bring our ideas and products samples for you to view in the space you wish to do. Sometimes a little freshening up is all that you need. Other times, you need a complete makeover. I'm here to do that for you because it's all about YOU! Picking colors that coordinate can be a challenge. We can team up together with you to come up with a solution that you will be pleased with. Everything from ceiling to floors we can do it. From home furnishings, art, upholstery, bedding, pillows, lighting, flooring, accessories, fabrics, window treatments, let's not forget about your walls. We are able to make the changes that will bring new life to your surroundings. Call me and let's get started. Can you hear the waves? This coastal living room “inspired” by the colors of driftwood that you would find along the sea shore. The calming natural woven drapery in sand tones. The wooden coffee and lamp tables are stained in a weather pier finish. The beautiful green glass lamp sits on top of a console table with tones of weathered grey. The round wall mirror in sea shell tones of green, blue, gold and silver pull this area together. Picking the shades of sea blue and coral used in the pillows and accent pieces bring in a pop of color and interest. Cozy up the sofa with 2 slipper chairs. The ottoman can be used for additional seating. We anchor this room witha natural painted sisal rug with the feel of sea weed floating to the surface. The paint colors remind me of the ocean and sandy beaches. Kick the sand off your feet and relax. Walk into this modern glam master suite. The inspiration for this master suite tells the story through the picture of a couple embracing each other. 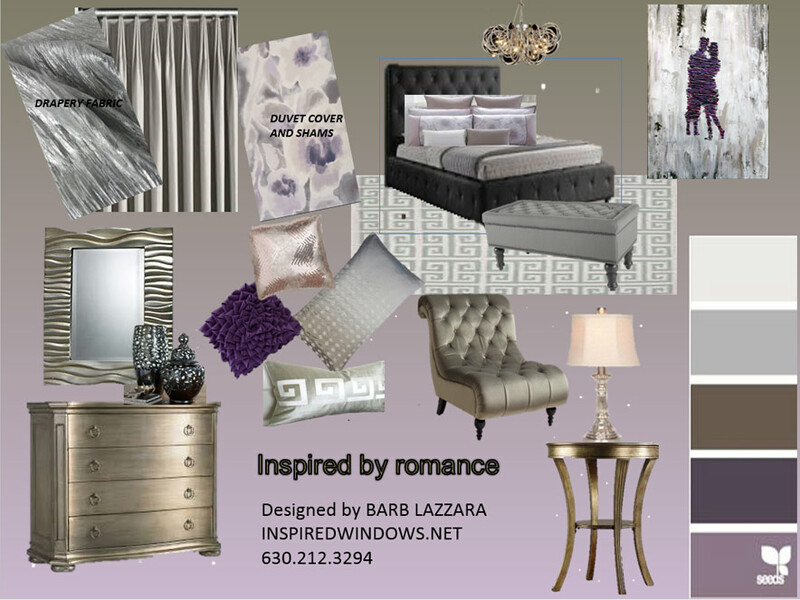 The colors of golden bronze, pewter and silvers, and shades of lavenderand cream create peaceful romantic atmosphere. The elegance of the European Pleated Drapery using Silver Sateen creating privacy with a sophisticated ambiance to this room. The duvet cover picks up the colors that we use throughout the room. The four drawer chest paired with matching dresser gives plenty of room for your things. The modern tubular silver chandelier over the bed reflects themood of the room. A Greek Key pattern rug pulls the room together and will soften the hard surfaces. Enjoy a good book relaxing of the tufted rolled back armless slipper chair. Illuminate your side tables with mercury glass lamps with bell shaped lamp shade. Add a bench at the foot of the bed, then add some pillows. The accessories in a liquid black porcelain urns top the chest, along with the wave pattern mirror. This sets the tone for a get away every night.